I wanted to do our update and share the sexes at the same time, but we were just too excited to wait on sharing that we’re having a boy and a girl! 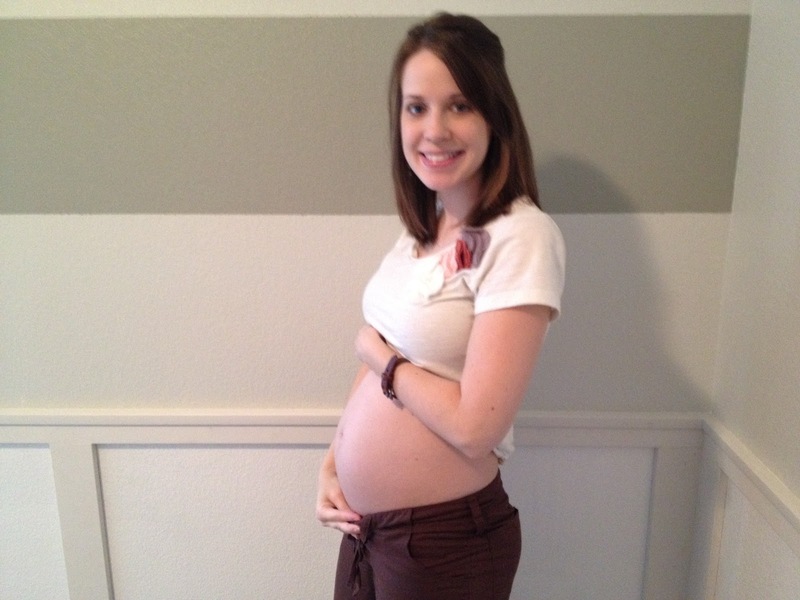 So here’s the 18 week bump picture a few days late. As you can see the wainscoting is coming along. We finally put the rest of the slats on and the decorative molding on top. I am a master at applying wood filler now, just fyi. I spent 2 hours this weekend covering nail holes and spaces between wood. That stuff is magic! Now all we have left to do is a final coat of paint on the bottom and some touchups on the walls, which we hope to get done this week ahead of the delivery of our cribs and rocker this weekend! We’ll also hang the drapes this week that I frantically searched for once I knew there were going out of season. I ended up getting the very last set from Pottery Barn in Atlanta, GA! That would have been so disappointing, but thankfully, it was meant to be. Once all of the major work in nursery is done, the fun begins! I can’t wait to accessorize, and I have a list of craft projects that is forever growing, including decorating letters for baby boy’s and baby girl’s names. Wooden letters are $1.99 from Hobby Lobby. 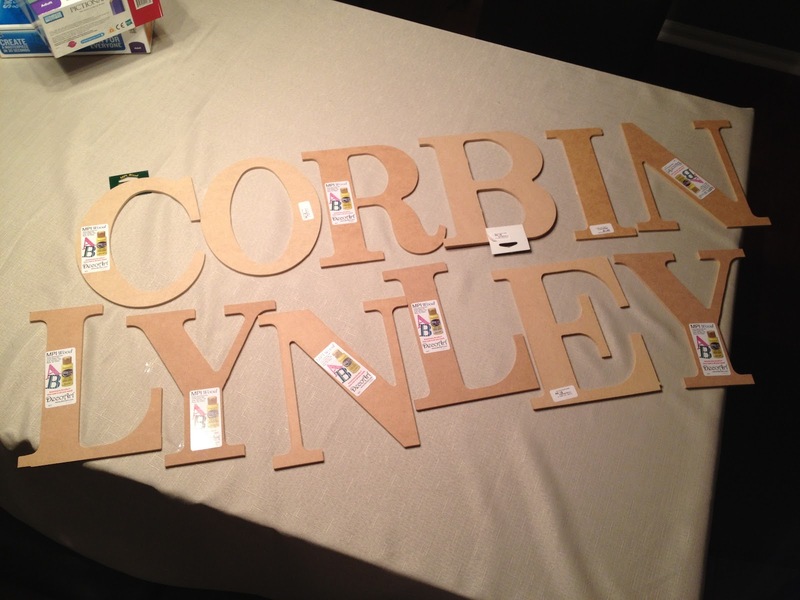 Their names are Corbin Dallas, middle name after Derrick’s middle name, and Lynley Diann, middle name after my mom. We’ve had these names picked out for a long time, but now that it’s real, we love them even more. Here are some details about the pregnancy so far. I plan on doing this update every couple of weeks with a new belly picture from here on out. Weight gain/loss: Up about 11 lbs. The goal is to gain 40, and I think I’ll hit the target or pretty close. Feeling: Up and down. Sleep is harder to come by and I’m still dealing with reflux. Growing pains have started as well, and I really need to schedule a massage! Maternity clothes? Still hit or miss with maternity clothes. I’ve bought a few things and returned so many. I’m still in between my regular clothes and maternity. I’m finding that the specialty stores cater to taller women. I am hoping I will eventually fit into at least $70 worth because I have store credit from a bunch of stuff they wouldn’t give me a refund on! Booo Until then I’m squeezing into whatever I can find at home for as long as possible. Sleep: Tossing and turning most of the night. That pregnancy pillow I was so excited about was not for me and has been long gone. My other 3 pillows have worked out well so far, but it may be time to get a big body pillow. Food cravings: Still craving carbs, but nothing specific. My sister will happy to know I haven’t french fries in a long time. 😉 I still don’t like eating sweets, like cake or cookies or candy. But I love fruit! I wish I also craved more veggies. Movement? Started feeling tiny flutters a few weeks ago, but I can feel taps now more frequently. Derrick still can’t feel from the outside, but it won’t be long. Best moment this week: Finding out we’re having a boy and a girl and naming them. What I’m looking forward to: Putting the cribs together this weekend. I am so excited I hope I will be able to spend time with all of you guys !!! We are praying all day for all of you and so excited for you both! I am so excited for you guys. I love to read your updates and see your little belly grow!! Praying for continued good reports of healthy babies and mommy. Love you!